I love Grey's Anatomy. Like LOVE IT! Season 11 is coming up and I am just as obsessed with it now as I was when I started watching it as a freshman in college. Now I know some of you might be thinking...."ugghhh, Grey's Anatomy....that show isn't even realistic anymore...I mean come on...a shooting, a plane crash, a bomb in a guys stomach, it's sooo unrealistic." But I don't care. I love every single minute of what happens on that show. But I will admit that I've seen so much Grey's that I just expect every hospital I go to, to be just like that. Obviously there are going to be tons of hot doctors to look at, obviously there's going to be lots of action happening at all times, obviously I'm going to get an inside look at the dramatic lives of all the doctors in the ICU, and obviously one of said hot doctors is going to take one look at his patients granddaughter and fall madly in love with me. I mean obviously. 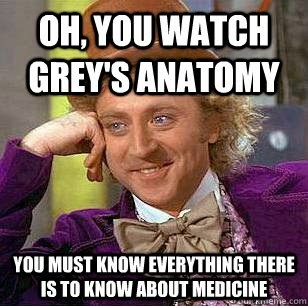 Well shock of all shocks, people, Grey's Anatomy is NOTHING like real hospitals. I know, it's depressing to think about. In reality hospitals are depressing, the doctors are old and not very attractive (although some of the nurses are. MALE nurses obviously), the rooms are small, it smells weird, and I did not get any sort of drama between any of the doctors and nurses that I encountered. It was highly disappointing and did fullfil any of my totally realistic expectations of hospitals. So I guess I'm just gonna have to settle for Grey's re-runs on Lifetime, Season 11 coming in September, and the following Grey's Anatomy Gifs! No intern group will ever compare to this one! Remember when Christina, George and Alex had a hot dog eating contest? Hilarious! 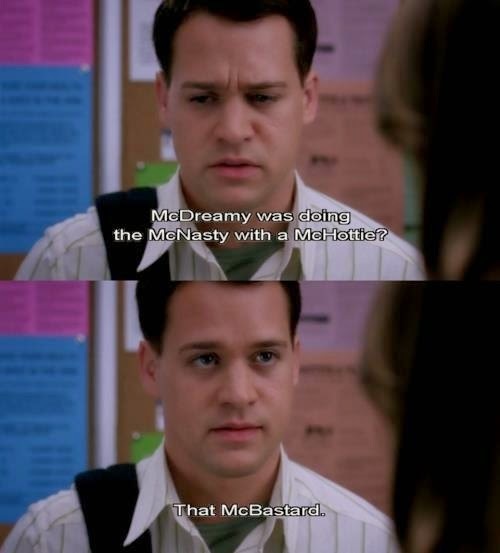 Oh how I miss Izzie and George. It should actually read "You wane be me but yo can't be me"
Now I'm gonna spend my Monday on the couch drinking tea and watching the Ladies of London marathon on Bravo in anticipation of the finale tonight! Woo Hoo! Why can't real life hospitals be like Grey's? Only I'd kind of like them to know what they're doing, but beyond that, there are definitely some things that could use a little change! PS. 6 years ago when I had my oldest daughter it was a literal scene out of Greys. Hot anesthesiologist, bitchy nurses arguing with my doctor and the whole gamut. Other than I was in a ton of pain it was all quite amusing.